We’ve been known on occasion to do a trip report in the style of the classic western, The Good, The Bad, and The Ugly, with a dash of The Magical thrown in for good measure. 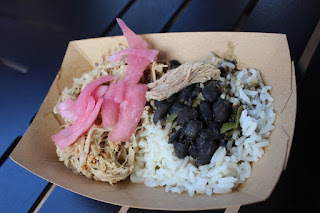 Today, however, as we look towards the second weekend of the Epcot International Food & Wine Festival, we thought we’d use it to give you all some mini reviews of some of the dishes we sampled last week. We didn’t get to nearly as many dishes as we would have liked, but hopefully this helps guide you to some tasty choices. Bon appetite! Liquid Nitro Chocolate-Almond Truffle with Warm Whiskey-Caramel (Chocolate Studio) – This was a bite you had to eat fast. It was like melty center of an ice cream sandwich, not quite solid, but definitely starting to sweat. Only this was better than any ice cream sandwich I’ve ever had. 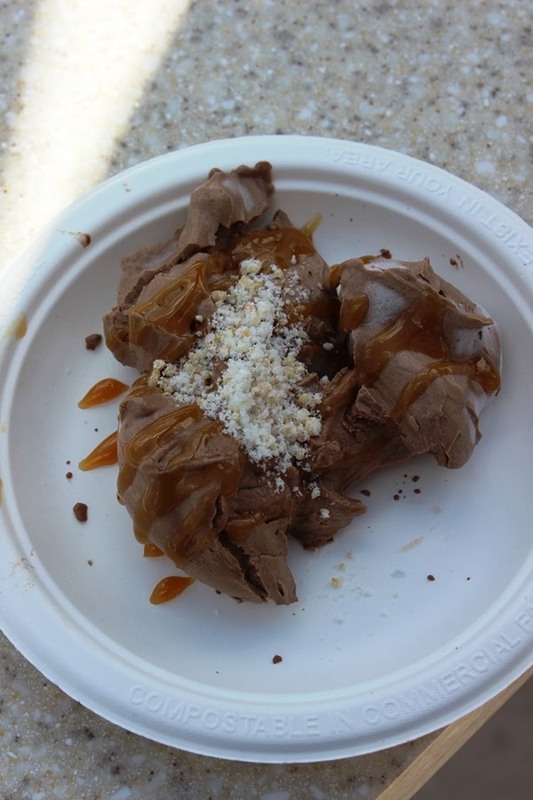 Rich chocolate with a hint of almond and caramel, this was a total win! 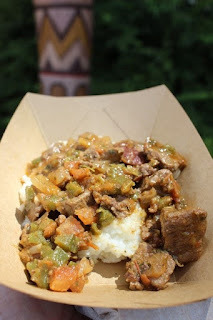 Berbere-style Beef Tenderloin Tips with Onions, Jalapenos, Tomato and Pap (Africa) – This was the dish I knew I was going to have walking in the gates. There is so much flavor going on here, and yet you can distinguish easily between the tomatoes, peppers, and okra. The pap was creamy and great with the tomatoes. Although I would caution anyone that if you’re not a fan of grits this dish could be tough to swallow, but for me it was awesome! The beef tips for fork tender and the dish had a set of spices that built a bit of heat over the course of the dish but were more a point of flavor that of spiciness. 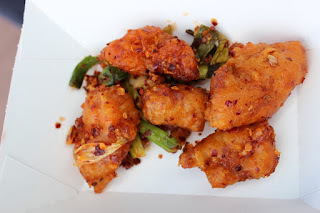 Sichaun Spicy Chicken (China) – I’m not quite sure what I expected here, but this dish is basically a handful of spicy chicken nuggets with a ton of red pepper flakes on top. They were fine for what they were, and probably would have been a pleasant surprise at any other point during the year, but during the festival there are too many great bites to settle for mediocre. Schinkennudeln: Pasta Gratin with Ham and Cheese (Germany) – This is a very dense stack of cheese and pasta that gets very messy as you dig into it. The crispy bits of cheese are always a favorite of mine, but there wasn’t enough here to really wow me on the dish as a whole. It was a fine utilitarian dish, probably best as a side, but there just wasn’t enough here to hold my interest. Chicken and Dumplings: Stewed Chicken with Mushrooms and Spinach (Farm Fresh) – I went outside of the box on this one and got a little snake bit. 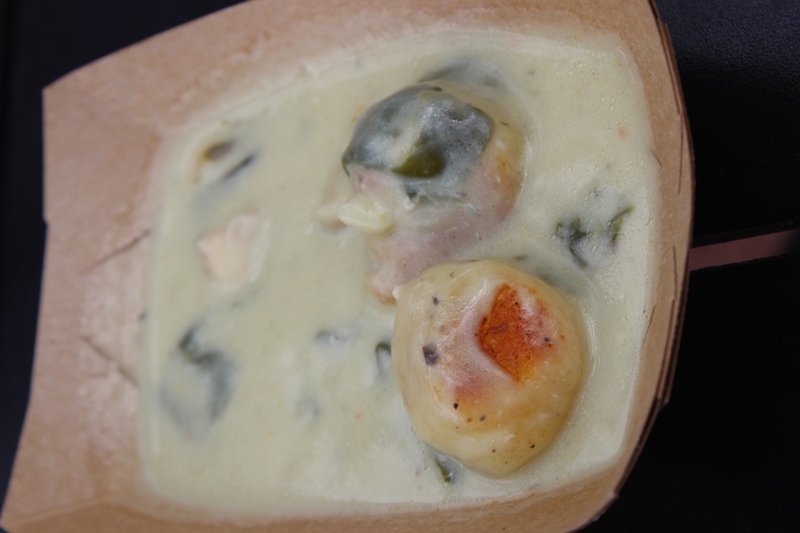 The chicken and dumplings were good enough to be higher up on our list, especially with the biscuit-like dumplings that were grilled off just prior to being added to the mixture, but it was the preparation that made this ugly. This is, for all intents and purposes, a soup. 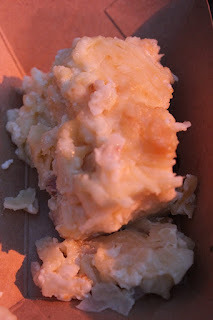 Yet, it was served up in one of the thin cardboard boats. I rushed through this dish hoping that I wouldn’t spring a leak and end up with chicken soup all over me. You should definitely try something at Farm Fresh, but you would be much better off opting for either the Loaded Mac ‘n’ Cheese or Pickled Beet Salad. Mojo Pork with Black Beans, Cilantro Rice and Pickled Red Onions (Islands of the Caribbean) – This was my first dish of the festival, and it couldn’t have been a better one! The pork flaked apart with the fork and had a wonderful flavor. The pickled onions were delicious, but not overpowering. The rice and beans were a hearty accompaniment, with just the right amount of heat. 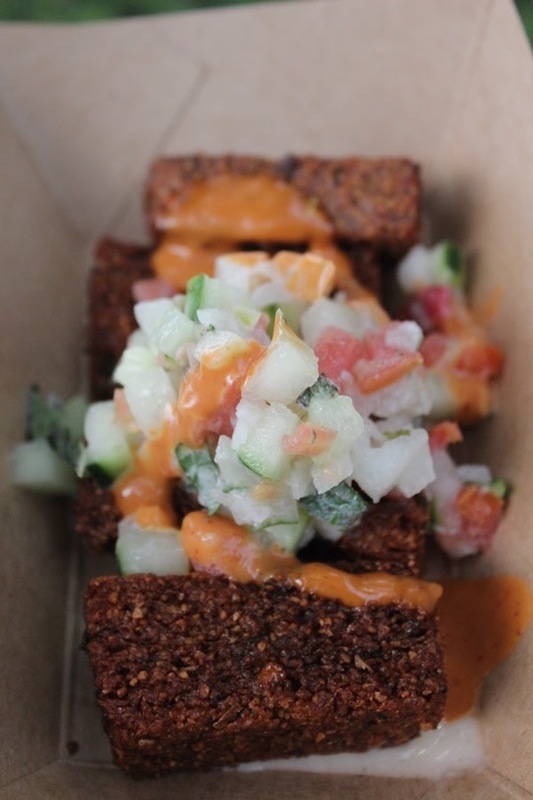 Spicy Hummus Fries with Cucumber, Tomato, Onion and Tzatziki Sauce (Morocco) – I expected a pile of French fries topped with hummus and a host of other toppings, this was not that and it is so much the better. While hummus and falafel are both made from chickpeas, I think the name created here was used because hummus seems a bit more friendly to people, but isn’t actually in the dish. 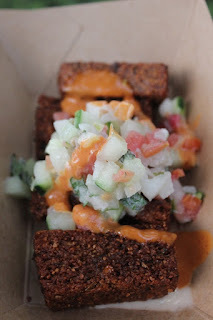 This is several sticks of falafel topped with a spicy tzatziki sauce and a cucumber salad that was fresh and delicious. Again, this was not an overly spicy dish. The falafel was well prepared and not over fried, which can happen when they are prepared in this type of volume. So there you have it! I hope something here tempts your taste buds and that you have an amazing time at the festival. I know I sure did. Let us know which of the above was your favorite, or if you found something entirely new that really rocked your festival!